One & Only The Palm, Dubai. Ranked #33 in our countdown of the 100 Best Hotels and Resorts in the World. An exclusive and resolutely glamorous resort accessible by both boat and car, though not quite as glitzy as the Dubai norm. 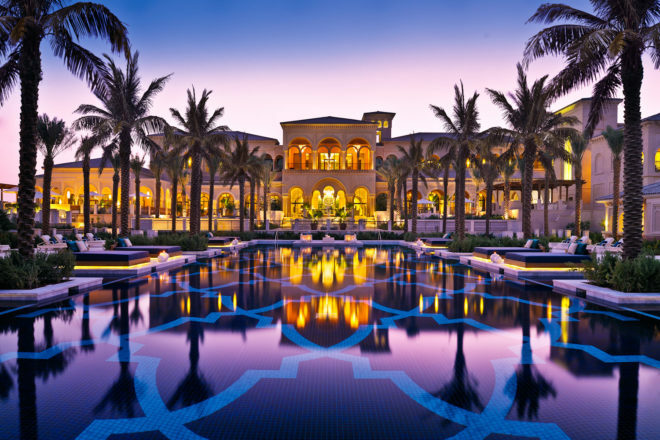 On the man-made Palm Jumeirah archipelago, the hotel’s Moorish-Andalusian architecture and Arabian-international interiors are sumptuous and sophisticated. Beachfront villas, suites and spacious guest rooms are designed to ensure privacy and seclusion. Michelin-starred, French super-chef Yannick Alléno directs the three restaurants – all set on the glimmering waterfront with Dubai’s reach-for-the-sky skyline glittering in the distance. Be sure to wear your bling post-sunset, casual attire will not fly with the Palm’s well-heeled crowd. Did you know Resident DJs spin beats after dusk at the resort’s (and possibly Dubai’s) hippest bar, 101. Cocktails cost a sheik’s ransom but you can surreptitiously check out celebs, so why not.